Luxury, sophistication, vivacity and opulence – these are the words that describe today’s impressive feature apartment. 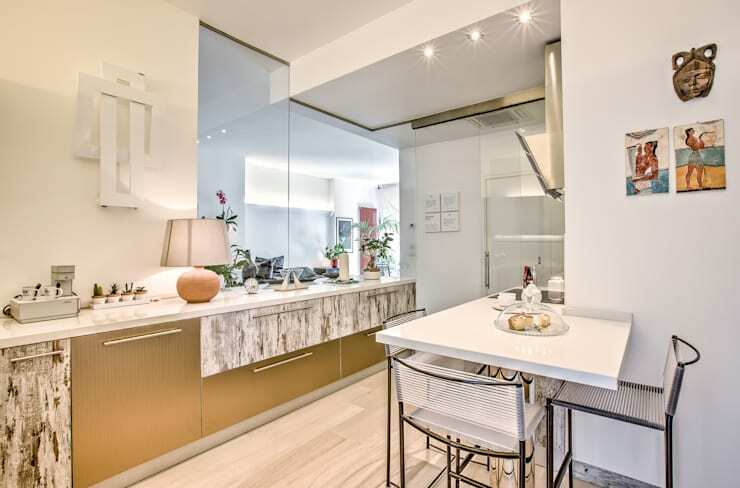 Conceived, planned and undertaken by Ghinelli Gazzola of Ghinelli Architecture, this 110m2 apartment was decorated and completely renovated for under $S122,000. Truly a modern example of lavishness and style, this gorgeous abode also reflects a personal touch, with plenty of warmth, comfort and liveability. Boasting an exquisite range of curios from the owner’s travels, this individual dwelling is replete with movie-star good looks and a scene-stealing ambience. The architects and designers of this majestically decorated apartment certainly know how to turn heads. Boasting movie-star good looks and opulent finishes, this shiny, sparkly and dazzling space is impressive to say the least. Here in the kitchen we see the different range of tones and shades that have been employed. Evoking a sense of conviviality with its light hues, the room is inviting and interesting. An open plan space, the apartment opts for sliding glass doors to keep the kitchen separated from the rest of the home, ensuring odours are retained within the kitchen, as well as providing a little sound privacy if needed. As we enter the kitchen we get more of an idea of the layout within the room. A small table and chairs is built into the worktop area, offering a handy eating space with an informal ambience. 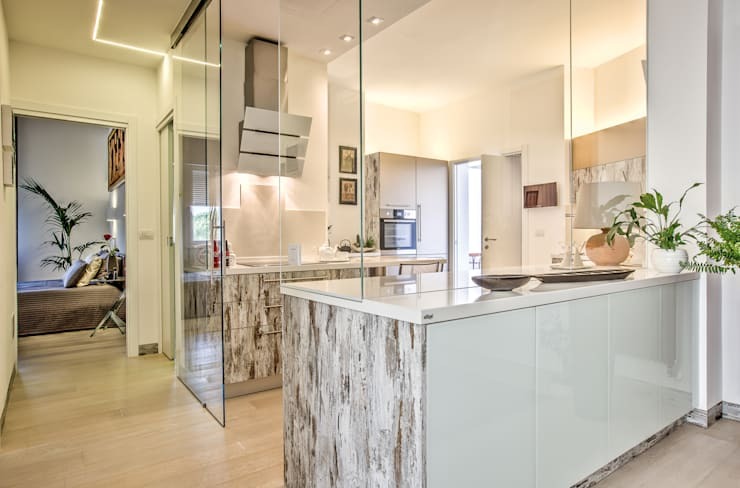 The joinery in the kitchen is rather interesting and exudes individuality as well as personality, providing the kitchen with a unique and eye-catching aesthetic. Keeping the space light and bright is a combination of downlights, as well as the aforementioned glass sliding doors and walls that let natural light flow throughout the apartment. Within the dining room we're able to glimpse the combination of different eras and styles seen throughout the abode. 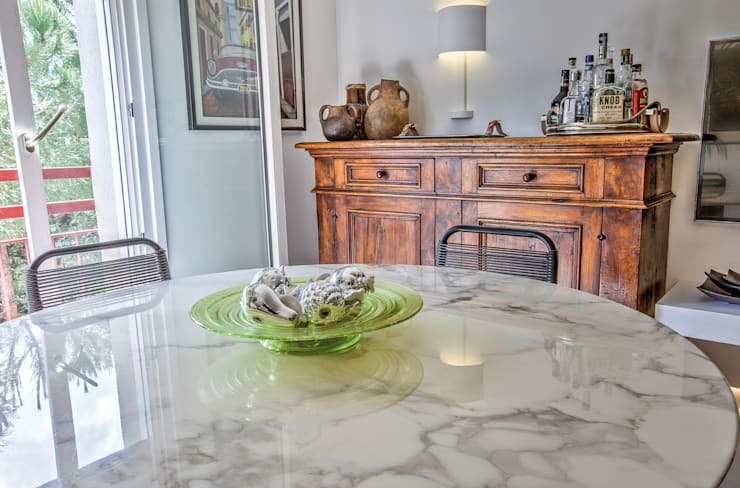 The cabinet in this space is antique, while the table is rather modern Carrara marble, with contemporary dining chairs. The room is beautifully personalised with a tray of liquors, as well as individual artworks that have been framed and hung on the walls. Although slightly out of sight, we also catch a quick peek of the balcony doors, which let in a huge volume of natural light and provide access to the exterior terrace. Here in the bedroom the colour scheme is both tranquil and serene, offering solace from the rest of the apartment in the form of sumptuous, upholstered furniture, shiny accessories and an earthy ambience. Simple yet highly effective, the room is decorated in a combination of eye-catching accessories, and welcoming pieces of furniture. 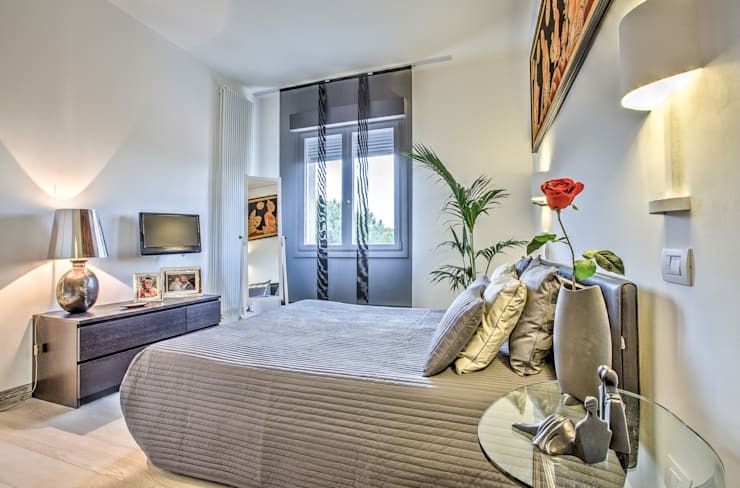 Not just a pretty face, this bedroom also comes replete with some great additions including a wall-mounted television, artworks and indoor plants. 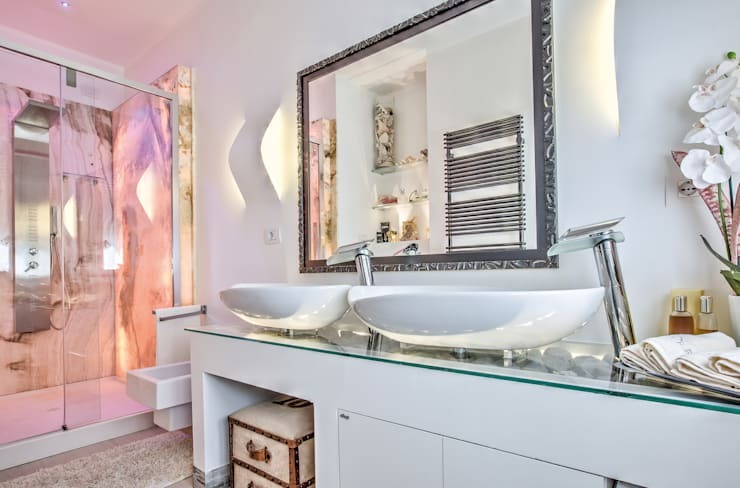 The bathroom says a lot about a house and its occupants, and this room certainly doesn't disappoint! Bursting at the seams with impressive features, we're shocked by how lavish and welcoming this space feels. A huge mirror has been added to the vanity, while in its reflection we can see a range of accessories, perfectly curated to suit the space. The shower is a definite standout feature within this bathroom, with a range of settings that makes it spa-like and ultra-luxurious! Not only that, but the colour of the shower is also incredible. 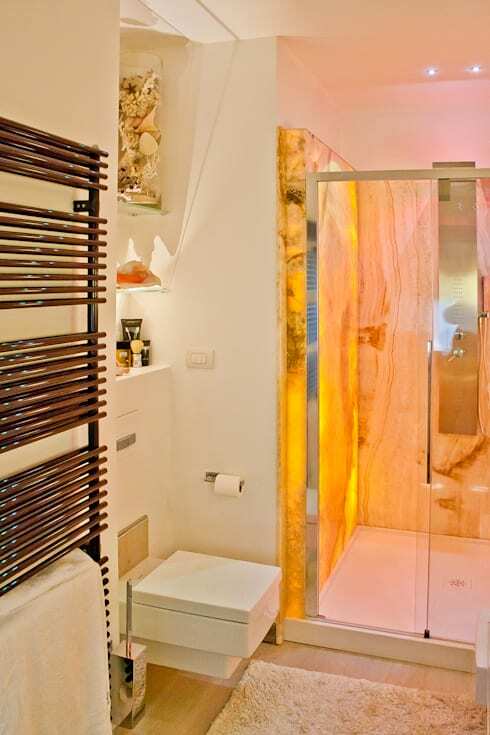 With back-illuminated pieces of stone, this shower filters bright hues into the space and ensures it is an unforgettable experience. What elements of this dwelling did you like, or maybe dislike?